Abraham Lincoln was the 16th president of the United States. 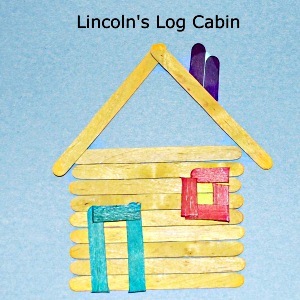 Create a log cabin with craft sticks to commemorate Abraham Lincoln. Cut smaller pieces to make door, window and chimney. Glue the horizontal pieces first, then add window and door. Lay the roof on the paper to figure out location of chimney OR glue the chimney to the back of the stick so you can ensure that it won't be seen from the front. Glue or write the title of the picture onto paper. Let dry thoroughly before moving. Smaller pieces cut from the craft stick may "crack" a little but it actually adds visually to the picture. Of course be careful of any rough edges. I just saw some small sized craft sticks that are about half the length that would be perfect for things like the door and windows. Read a book about Lincoln prior to the activity. The Lincoln Log Cabin State Historic Site in rural Illinois is an 86 acre history park which houses the replica of the 1840s farm of Thomas and Sarah Bush Lincoln, father and stepmother of our 16th president. Abraham Lincoln was a lawyer living in Springfield by the time his parents moved here in 1837, but he did visit them periodically.